Questions like "How do you make an HTTP request on Android" or "How do you do async/background JSON requests on Android", are question that often arise on Stack Overflow and blogged about elsewhere. Often the answers contain somewhat low-level code who leave a lot undecided for the developer. Firing an AsyncTask for the request to allow the processing to happen off the UI thread is good, but what if the UI element who fired the request is destryed when the response arrives? And what about parsing the resulting JSON? What about caching and throttling? These are questions that will be addressed in this post. A complete working project will provided at the end. Volley is a library by Google introduced at Google IO 2013 which set out to make REST client implementation simpler and faster. Unfortunately Google hasn't seemed to embrace their own project to the max, as it still is undocumented and no references to it seems to be found on developer.android.com. That doesn't stop it from being a powerful and effective library - enough blog posts exist about how to get started using it. This post goes a step further by introducing Gson for the simplest Json parsing. I also focus on 100% guarantee of any response being processed, which can be a challenge when dealing with Android activity lifecycles. While most people would start out using AsyncTask for the request processing, Volley uses a thread pool of 4 threads by default. This has several advantages. You don't need to spin up a thread each time a new request is sent. It's already there, waiting to serve you. Improves performance. If you do need more than 4 threads, you may download the Volley source code and tweak it yourself. If you need a lot more than 4 threads, you probably have a use case more suited for libraries like Ion. You can still apply most of the techniques in this blog post to that framework though. In addition to this, Volley provides optional caching of GET-requests, primarily intended for image caching. You might want to look into that depending on your needs. This example uses fields, but you can use Java-bean properties if you prefer that (I don't). The request completes and calls back to the now dead activity. The dead activity is either smart enough to realize it's dead, so it discards the request, or it tries to process it and the application crashes when tryin to updated a dead UI. This may sound as a far-fetched scenario or a rare edge case, but it is infact a real-life scenario I regularly encountered in production for a game I made. The solution is based on introducing an Event Bus, also known as the Pub/Sub-Pattern. I've grown fond of the Otto library from Square Inc, which does a fine job at that. Instead of having callbacks to the Activity, we rely on a dispatcher to publish the response on the event bus once any response arrives. Whether or not it is the original or a new instance of the Activity then listening, is irrelevant. Now a second challenge arise because there is a small gap between the time where the old activity is killed and the new is created. Context switches might occur here, responses may arrive and be lost. To amend for this I have in addition made a class called OttoGsonResponseBuffer, which will receive and buffer any requsts arriving in this gap. 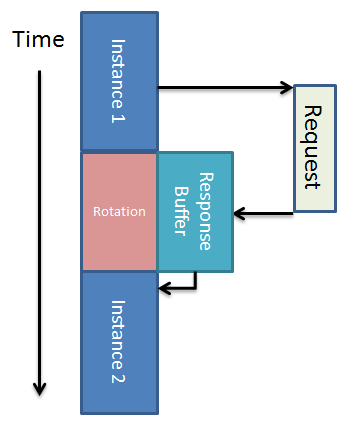 This way we ensure that no response is ever lost when the user rotates the device right after a request is sent. The way this functions is that Otto supports producing of events through the @Produce attribute, which will cause the response data to be resubmitted to the event bus once a new listener for that type of event subscribes. A word of warning here: Be careful when you use this buffer with regards to memory use. There is no mechanism of timeout or automatic flushing of the buffer as it is implemented now. Do not activate the buffer when user presses the back button (or flush it after he does), only when rotating the device. A complete working example and a proof of concept can be found at my OttoVolleyDoneRight github repo. It may also be used as a library by following the simple steps describe at the bottom of the README there. When launching the example you are presented with a simple button labeled "HTTP Request", which will send off a request to http://httpbin.org/delay/1. This service always delays one second before responding, which allows you to test rotating the device while waiting. You can up the number 1 to whatever you like if 1 second is too short. 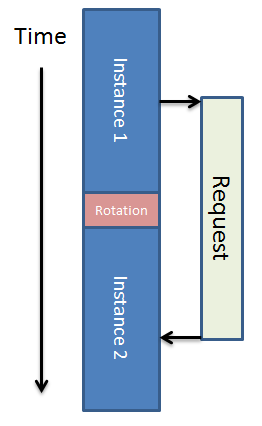 Notice how the request is processed in the new activity instance after the device is done rotating and the response arrives. There is just one pair of HTTP resonse message-bus class defined: VolleyRequestSuccess/Failed. This means that you must check the type of response in the onHttpResponseReceived-methods of your listener classes. Due to type erasure in Java, you can only have one listener method in each class as it is now, and it will receive any kind of response. In any case I believe this pattern provides a solid foundation for a JSON-based HTTP REST client for Android, and you'll have an application with fewer potential bugs than if you follow most other guides I've read so far online. Feel free to argue against me or come with suggestions for improvements in the comment below. How about fetch being done in a service and store the result in database ? Sounds like overhead for such a simple task and doesn't solve the problem of the request finishing during rotation. Hi, you said "Firing an AsyncTask for the request to allow the processing to happen off the UI thread is good, but...", however AsyncTask runs on the UI thread, not on an alternative thread. It does not share the lifecycle of the Activity so it can run in the background (meaning, when the activity it is in, is not visible), maybe that is what you were referring to? It clearly says "Override this method to perform a computation on a background thread." . I.e. NOT ui-thread. Is it so that you must initiate the call on a background thread for it to execute on a background thread? Anyway, that's what "most people would do" with HTTP calls as I was referring to in the blog post. That logcat does not prove anything. Do not conflate threads and processes; A thread does not spawn a new process. AsyncTasks do, in fact, use background threads. Use Thread.currentThread().getName() to validate which thread you are on. I'm a full stack developer focusing on Android development right now for Norway's biggest news paper VG.no. In addition to Java I've done a lot of .NET and web-stack development in my career. I have a masters degree in computer science from the Norwegian University of Science and Technology (NTNU).